Juana Molina's third album "Tres Cosas" focuses more on melodies and singer/songwriting than on abstract electronic soundscapes and polyrhythmic percussion. Molina's vocals are more upfront, she sounds more confident even though it remains closer to whispers than full-throat singing for the best part. The instrumentation is generally more sober, almost anemic at times, and the prominence is given to the acoustic guitar, which Molina plays with much skills and delicacy. Therefore "Tres Cosas" could be more aptly filed into folk music than its predecessor if it wasn't for the idiosyncratic take favored by the artist. Electronic oddities are still present throughout the album, but they are most of the time relegated to the background with some emergence here and there, most notably on songs like the unearthly "Yo Se Que" with its lightly mindnumbing electronic hum of an intro soon accompanied by a tiptoed percussive pulse and Juana's apathetic vocals. Despite its low key atmosphere, this song keeps fascinating all along. The surreal quasi instrumental "Filter Taps" is another electronically disturbed oddity on the album while the wordless "Uh!" with its whiplash sounding percussion and bumpy bass line represents one of the few rhythmic momentum here. The melodic emphasis is however confirmed on numerous songs like the title track, despite the atonal synth, the dainty nursery rhymes "Salvese Quien Pueda" and "Solo Su Voz" (with Petra haden on violin), the discreetly waltzing opener "No Es tan Cierto", the lighthearted almost joyous fairy tale sounding "El Cristal" and especially the very beautiful, tender and melancholic folkish lullaby "El Progreso", with ambient electric guitars, cello and subtle electronics. The latter could be a cousin to "Busca Bien Y No Molestes" on Molina's debut "Rara". On the other hand, Juana's voice is leading on the delicate psalmodic song "Isabel" and the heartfelt lament "Curame", one of the very rare emotional instants on the artist entire catalogue, she even dares some very discreet tremolos. Two very beautiful songs that could make one think of earlier luminaries like Vashti Bunyan or even Nick Drake. And there is the welcoming surprise as a closer, "Insensible", a near neoclassical piano-driven song en français dans le texte, which lyrically feels like the woman answer to Antonio Carlos Jobim's "Insensatez". 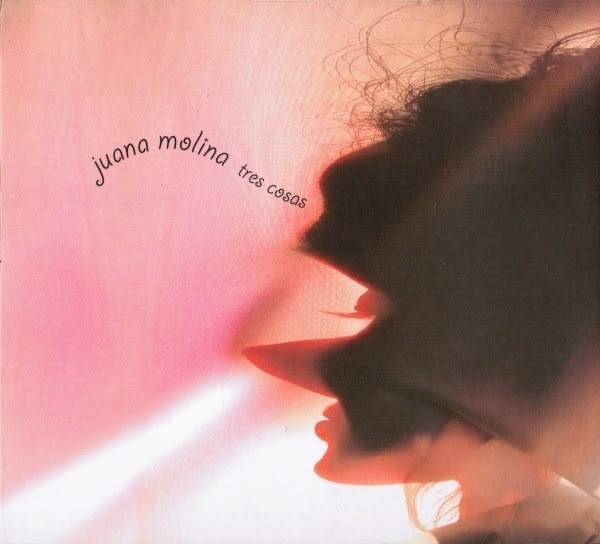 The compositions on "Tres Cosas", mostly the melodies, are more accomplished than on "Segundo", it brings Juana Molina closer to more traditional singer/songwriting, her voice more than once giving the impression of a bossanova singer who has decided to record a folk-slightly-tronica album. The album is still very singular and unique yet less groundbreaking and innovative than "Segundo". Another pearl though to add on Molina's already intriguing germinating catalogue. Sound designer Alejandro Franov is still close at hand all over "Tres Cosas", but his contribution is more reserved. He provides, among others, the tasteful piano accompaniment on "El Cristal". Maybe Juana Molina and him decided to save his more experimental side on their next collaborative album "AooB".